Lisa J. Smith is the founder of Peeps Publishing. Named after a "group of friends" who inspires her, motivates her, and keeps her nose to the grindstone, Peeps Publishing is dedicated to bringing you the best quality, inspirational, and empowering diverse products from Lisa J. Smith. Lisa found that after the long waits, the hoops that publishers make aspiring new authors go through, and the number of rejections that the average author has to go through before getting their book published, she could bring it to you the same way much easier. For years, her beloved clients and listeners have been asking her where her books are? Well now they are here for you. Lisa decided to start her own publishing company and publish her own work. As she always says, "if you want something done you have to do it yourself." Publishing has been no exception. Lisa J. Smith's books are available for purchase through Amazon, Barnes and Noble online, small independent bookstores, signed books via this site, and Kindle. Check back often for the many new books and products that offered by Lisa J. Smith. "Message of the Moment" was inspired by the people that Lisa J. comes in contact with in her everyday life, her own ups and downs, and the lessons she has learned by working with her beloved clients and listeners over the years. In a playful, yet poetic and unique style, Lisa has put together some of her most popular teachings over the years into one book. The messages are for you, your family, friends, children, and even can apply to your co workers. Each message has been written so anyone reading these messages of the moment can be inspired to live an authentic life, filled with inner peace and self love, all with a fresh perspective. 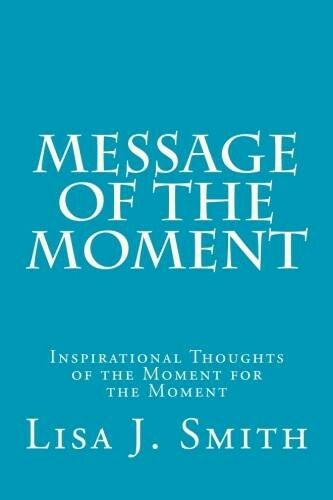 “Message of the Moment" is a daily inspirational book to uplift, empower, and remind you of the greatest tool you have been given, yourself. Read straight through or turn to a random page to get the message that you need for that moment. With Lisa's simple, yet truthful, and down to earth approach, her daily messages have been reaching people around the globe and uplifting spirits daily. Whatever way you choose to use this book, you can be sure that you will feel the positive, life changing, and loving messages from Lisa to you. Now you can have them wherever you go all in this one book. As she always says, "wherever in the world you are, I am too."